ARLINGTON, Va. (AIA PR) — The Aerospace Industries Association announced today that Eric K. Fanning will become its president and chief executive officer, effective January 1, 2018. Fanning is well known in Washington, D.C., and to AIA member companies for his ability to deliver results at the strategic level. Most recently, Fanning served as the 22nd Secretary of the Army where he provided leadership and oversight of our nation’s largest military service, the United States Army. 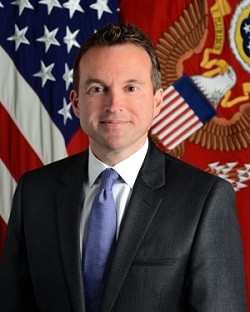 Fanning previously served as Chief of Staff of the Secretary of Defense, Acting Secretary of the Air Force and Under Secretary of the Air Force, and Deputy Under Secretary and Deputy Chief Management Officer of the Navy. He is the only person to have held senior appointments in all three military departments and the Office of the Secretary of Defense. During his more than 25 years of distinguished government service, Fanning worked on the staff of the House Armed Services Committee, and was a special assistant to the Secretary of Defense and associate director of political affairs at the White House. “The aerospace and defense industry is at the forefront of some of America’s greatest challenges and opportunities. For us to continue leading the world demands strong leadership in foreign policy and national security, stable budgets, a vibrant economy where everyone has the opportunity to live the American dream, and the prosperity to create a skilled workforce capable of taking advantage of good-paying jobs that support families and communities. As we navigate this dynamic environment, our nation expects that we will properly equip our forces and allies, ensure safety in commercial aviation, and build an environment that inspires space travel and the minds that create it,” Fanning said.